Draco and Harry were sitting in the Griffindor common room reading their books. Draco was sitting across from Harry on the couch. Harry looked up at Draco realizing that he was asleep. Harry got up and sat down next to Draco, he put his head in Dracos lap falling asleep with him. Hours later, Draco woke up to Harry sleeping soundless on his lap, cuddling up to him. Draco flinched at the sight of Him, Harry woke up and jumped off of him. "I-Im so sorry, I wasnt thinking strai-"  Harry was cut off by Draco putting his hand over his mouth. "Its ok, I dont mind. I actually enjoyed it.."  Draco pulled him hand off of Harry mouth. 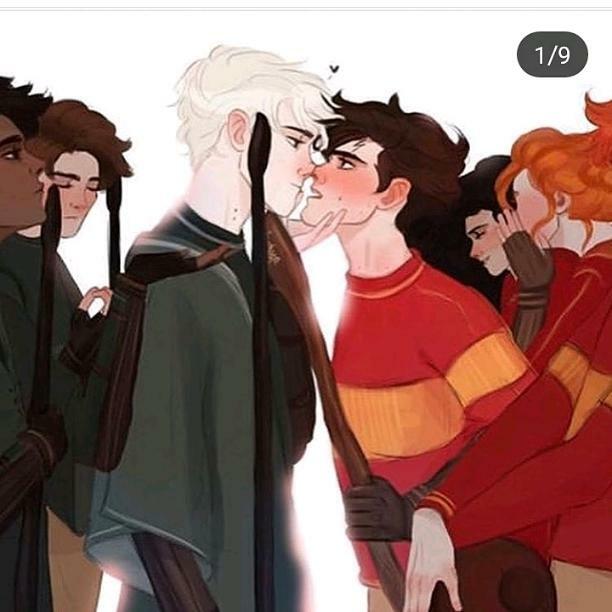 As soon as he pulled his hand away Harry kissed Draco softly and pulled away. Dracos eyes widened with shock and pulled Harry into another kiss returning the gesture. They started dating after weeks of flirting with each other. They lived their lives happily together forever.